The HD Spikers hope Honey Royse Tubino, Rachel Anne Daquis and Jovelyn Gonzaga would blend well quickly with the squad. 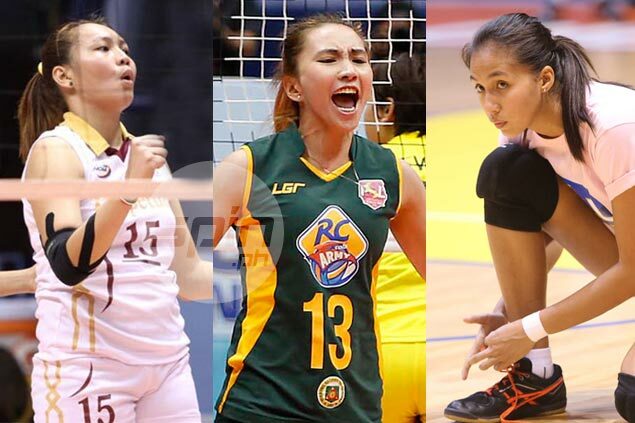 THE flurry of transfers continues in the Super Liga and Cignal boosted its strength by tapping the services of Rachel Anne Daquis, Jovelyn Gonzaga and Royse Tubino. The trio of Philippine Army standouts has started training with the HD Spikers at the Rizal Technological University gym to prepare for the Invitational Conference. The three Lady Troopers join newly-acquired Maica Morada from Petron, boosting the squad led by Mylene Paat, Chie Saet, Janine Marciano, Paneng Mercado, Len Cortel, Cherry Vivas, Sandra de los Santos, Lourdes Patillano and Jheck Dionela. “Sa totoo lang, medyo excited kami kasi matibay ang lineup,” said Cignal team manager Edgar Barroga on Thursday. Daquis, whose jersey No. 3 was retired by her alma matter Far Eastern University, will be reunited with her first coach with the Lady Tamaraws and now Cignal mentor George Pascua. Pascua and Daquis were also part of the Petron team that swept the PSL All-Filipino Conference in 2015. The 29-year old Daquis won the MVP title when Philippine Army dominated the PSL All-Filipino Conference in 2014. Gonzaga was a key player in the Lady Troopers’ three consecutive championships in 2013 and 2014, while Tubino led University of Perpetual Help to three consecutive championships in the NCAA and was named MVP on her final year. “Nakikita ko sa lineup, sabi ko Cignal is really an awesome team, ‘di ba?” said Barroga. Daquis was a regular guest player for Army the past seven years but declared she is open to offers from other teams as the Lady Troopers take time off the PSL to undergo a mandatory eight-month military training in Tarlac. Gonzaga and Tubino are willing to do their military duties but have been cleared to play as they also look to battle for spots in the national team that will compete in the AVC Asian Seniors Women’s Championship and the 29th Southeast Asian Games on August, according to a source. “So na-achieve na namin ang lineup, ang challenge na lang is how to build chemistry and how we would jell them together,” said Barroga.